"Have eaten here more times than I can count. Love their pizza. The Chicago Deep Dish is an excellent change of pace. Having a gluten free pizza is huge for our daughter!! 5 out of 5 stars!" "Met some friends for lunch. They were only open on one side - sports bar. We were there for about 2 hours and we did not feel we were pushed at all. Food was very good - typical sports bar fare. VERY generous portions - could have easily split Po boy sandwich. 4 out of 5 stars"
"I can only attest to the pizza, as that is the only thing we had on a recent dinner visit, but the pizza alone is worth the stop. I've lived in Lakeville for a dozen years now, and I'm kicking myself for not going to the Ole Piper more. We stopped primarily because we were hungry when we happened to be driving by, and I'm very glad we did." "I have eaten here dozens of times. Always happy with the pizza. Have also enjoyed other items from the huge menu. Super nice people. I have been going here for over 20 years. Lucky to have it 2 miles from home !!" "There are lot of menu options: pizza, pasta, hoagies, chicken, etc. We had their new Chicago style pizza tonight and it was fantastic! The service was fast and never had to wait for anything. There are many TV's in the sports bar section to watch your favorite game. Thanks to Deb, Laura, and June tonight for the great service! 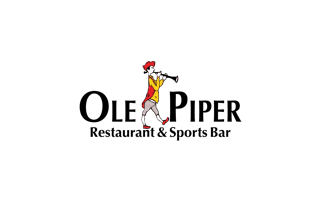 Keep up the great food and service Ole Piper, we'll be back!" "Ole Piper is a family favorite. Their menu is sure to offer something for everyone with salads, pasta, pizza, sandwiches, Mexican food,etc. While you wait for your food they have popcorn to tide you over. This combined with friendly service makes Ole Piper a great spot to go for lunch or dinner. 5 out of 5 stars"
"Every time I come to Apple Valley I will make every effort to make this restaurant. Great pizza and great dining. Monday has great specials for families. Staff is great and down home and I would recommend this for everyone." Make every effort to make this restaurant. Great pizza end great dining. Monday is great specials for families on specials. Staff is great and down home and would recommend this for everyone." "Amazing food!! Amazing service!! Def recommend, best pizza in town!! We had a great time, sat right away, pizza is awesome and the waitstaff were incredible!! Never disappointed !!" "Ole Piper Inn is my go-to place to meet up with friends whenever I'm back in the 'Ville. It's locally owned and has been an institution in the neighborhood for as long as I can remember. They specialize in pizza (which is delicious) but have a full menu of other bar and grill type entrees and apps - the mozzarella sticks especially are fantastic. The staff is very friendly, and they have lots of TV sets so it's a great place to catch a game." "My significant other's coworker recommended this place... when we walked up I was not sure that I wanted to eat here. It's a dive bar/ restaurant. However, we decided to take the chance since we were already here. The food was good. We were both surprised. My significant other said the burger was one of the best he's ever had. The french dip sandwich was pretty good too. The server was friendly and helpful with suggestions." "In my opinion, you cannot get a better pizza in Dakota County. The Supreme and Cheeseburger Pizza are my favorites. The menu has an extremely broad selection so ordering from there is typically no problem for larger groups of people. The employees all the way up to the ownership are bonafide good people as well." "It had been awhile, but our neighbors joined us for a delivered pizza from here. We LOVED IT! We had forgotten how good the pizza is. The sauce, crust and toppings were all perfect and they even delivered! Thanks for a fun night Ole Piper! 5 out of 5 stars"
"Very friendly people staffing the restaurant, and it was crowded when I went there at 7:00 on a Friday night. My cousin and I had called around to find someplace where they were showing a game we wanted to watch, and the folks here were happy to put one of their flat-screens on the game we were interested in seeing. Many of the other screens were showing the same basketball game or Scooby Doo, so it was nice to have such willing assistance.I had the Spicy Meat Lovers' Pizza and part of a bowl of the Clam Chowder. The clam chowder was incredibly thick - more so than pudding - and it didn't really taste that great. I did like it a bit better as a dip for the garlic bread-stick that came with it, though. Interestingly, a manager (?) came out to ask me how I liked the chowder, and when I sort of made a face and hesitantly told him that it wasn't really everything I wanted, he told me that it was made fresh every day. He then asked me if it was too thick. In fact, I didn't mind the viscosity, but I did think it was too tangy. He was very gracious, and he took the chowder off the bill.The pizza, on the other hand, was VERY good. Made with spicy sausage, jalapeno bacon, and a spicy pepperoni, I think. NICE! Although it was almost as greasy as the pizza they used to serve at my high school..."